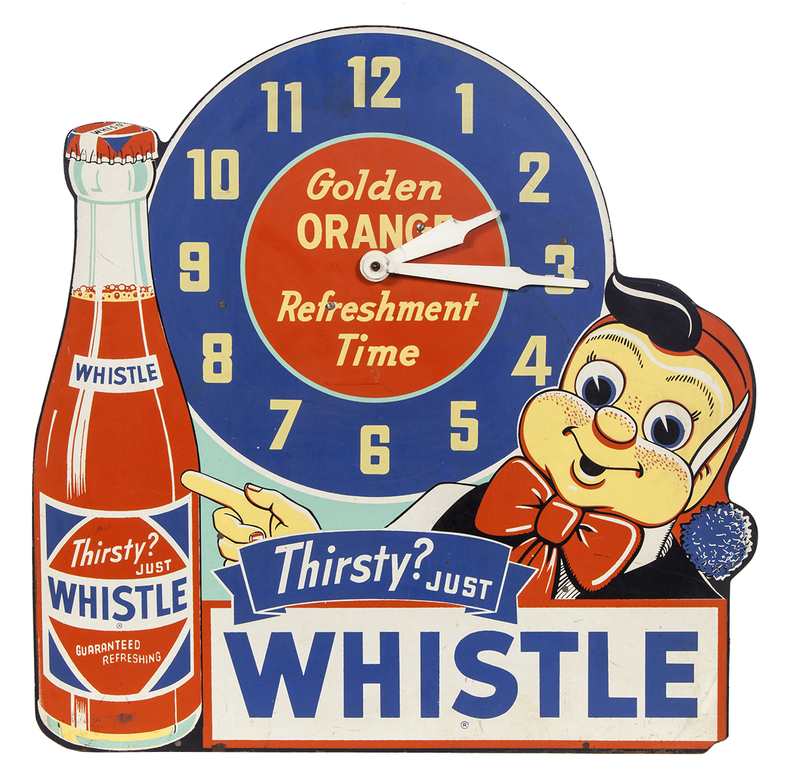 THE WHISTLE GOLDEN ORANGE DRINK ELVES SOLD A LOT OF SODA! 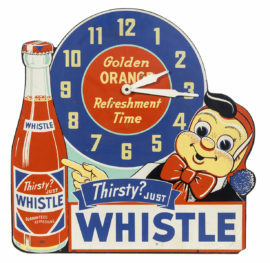 The Whistle Soda Brand of Golden Orange Goodness was for years one of the better selling soft drinks in the United States. Invented in the 1920’s, the brand was synonymous with an elf or several elf characters featured on their advertising pieces. Most of the elves are shown working busily either hauling soda cases with dollies, or hauling signs, etc. Similar to what you might expect in Santa’s workshop, the elves were always portrayed as hard working characters supporting the Whistle brand. This well known and famous masonite wall clock features one of the elves also. If you look at many old general stores or corner grocery type of establishments in the 1940-60’s era, it is amazing to me just how many of these clocks adorned the walls in these businesses. This sign along with coca-cola signs is easily one of the more recognizable signs of that era in many photos. The sign was so popular with collectors, that it has been reproduced, and with a good eye it isn’t too difficult to determine an original sign from a reproduction, due to size, length of the clock hands, and the material the sign was made of. Sylvester Jones who also created the Vess brand of soft drinks is credited with inventing the Whistle Brand of soda too. Mr. Jones was a hard working and successful soft drink manufacturer based in St. Louis, MO. The Whistle brand was so successful it was licensed to be produced and made by various soft drink bottlers throughout the U.S.
WESTERN BOILER PIPE COMPANY OUTSTANDING POTTERY ICE COOLER!120 YEAR OLD BREWERY CORNER SIGNS RECENTLY REUNITED!